Anim’est – The International Animation Film Festival, established in 2006, has become Bucharest’s most anticipated film festival and a recognized event on the international animation scene in Europe and Asia. Bill Plympton, Georges Schwitzgebel, Juan Pablo Zaramella, John Dilworth and Mike Reiss are just some of the great names who have presented their animation films and/or lead lectures and workshops. 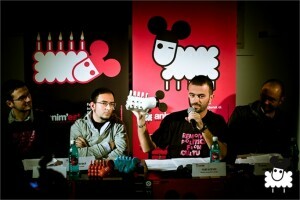 Different partner festivals in the region, animation schools and guest studios participated in Anim’est too. 6. Balkanimation – dedicated to films produced in Albania, Bosnia-Herzegovina, Bulgaria, Croatia, FYRO Macedonia, Greece, Montenegro, Romania, Serbia, Slovenia, Turkey. 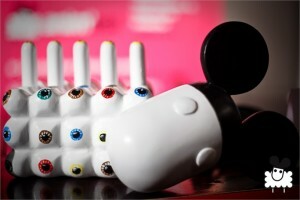 In the Mozaic section, the hottest short and feature animations in international film festivals were featured. There are also special and retrospectives dedicated to important animation studios, directors, film schools and festivals. The most important mission of Anim’est is not only to entertain the audience (children and adults alike), but also to reinvigorate and support the Romanian animation film industry. It aims to create a market for this special field, promote new voices and create a link between similar festivals in the region. Among the animation directors who made their debut in the Anim'est Romanian film competition are Marius Pandele, Liviu Barbulescu, Cecilia Felmeri, Andreea Bogdan and Bertoti Attila. “The Gods of Asian animation” came at Anim’est 2010! The Studio 4°C retrospective presented by Animax enhanced the 2010 Anim’est International Animation Film Festival’s programme with the Romanian premiere of five cult feature films, some of which are the most important anime titles produced worldwide. Founded in 1986, Studio 4°C has rapidly developed into one of the best known film and animation studios in Asia, standing out through their remarkable diversity in animation styles and story selections. It has worked with countless of Asian and American producers too. Genius Party Beyond, the omnibus film by five important animation, comics and graphic creators, all centered around the idea of creativity: Mahiro Maeda, Kôji Morimoto, Kazuto Nakazawa, Shinya Ohara and Tatsuyuki Tanaka. It is a popular title amongst animation filmmakers and fans around the world and a landmark film in the development of animated film language. Japan was also represented in the competition section with the film Summer Wars, created by Mamoru Hosoda, in 2009, which had already won Best Animation Film at the Japanese Academy 2010 and Best Animated Feature Film at Sitges IFF 2010. FB: How do the Japanese films add value to the festival? What can they offer to the Romanian audience? LB: Japanese movies offer a diversity that every European festival needs to have geographically and stylistically. Japanese animation is among the richest and complex in the world. Famous directors’ name, and also famous production companies like Ghibli (created by Myiazaki Hayao) and Studio 4°C bring important names and films from the Japanese world of animation, some of which have been presented at this year’s Anim’est. FB: What were some of the audiences’ reactions to the Japanese animation films at last year’s’ Anim’est? LB: Last year we organized a retrospective dedicated to Miyazaki Hayao, with five feature animation films: Ponyo (2008), Howl’s Moving Castle (2004), Spirited Away (2001), Princess Mononoke (1997) and Nausicaa of the Valley of the Wind (1984). There was also a feature animation film Piano Forest, directed by Masayuki Kojima, in the competition section which won the prize for its category. Audience reactions were very warm therefore we decided to present Japanese movies again this year. FB: What are the different elements that make up an Asian movie? LB: Manga style has its fans all over the world, including Romania, and it is a very specific part of animation. First of all, it is more commercial and accessible than the esoteric style of art animation like that of the Columbian, León Prozak, who passes beyond the limits of experiment. Yet at the same time, it is less entertaining than a Disney production. Clear drawing, the story is the same, combining the fantastic elements with the real ones…Then we can observe in Japanese animations subjects that appear repeatedly. (which Miyazaki fully exploits in almost every movies he directs). Another theme is ecology, environmental issue, when the man destroys nature and nature takes revenge on man; man that gives birth to monsters where the scientific experiments are uncontrolled; world disaster due to man. These are part of a collective consciousness of the only nation that experienced an awful event – the atomic bomb. FB: Which was the role of the Japanese Embassy in putting together the special screening section of Studio 4°C retrospective? ST: The Embassy was not involved in choosing the movies for this retrospective, but with the support of the Embassy, the organizers of Anim’est received financial aid from the Japan Foundation. The Embassy took part by promoting the festival in many ways, such as: publishing news on its website, sending information among members of the Japanese community in Romania and other persons interested in the activities of the Japan Embassy. FB: Can you tell us more about the strategy of promoting Japanese culture and civilization in Romania? ST: In mid October 2010 we organized a very successful event: Japanese tradition in the Village Museum in Bucharest. This event drew more than 1000 visitors. At the end of October we will organize an Ikebana Demonstration, lead by master Ogo Rimei (from the Koryu Sho-o Kai School). In November and December, we will have a varied programme of Karate demonstrations, The Ambassador’s Cup of IGO and two conferences on economical issues led by Japanese specialists. In 2011 we will be hold an important international conference on Japanese studies that will take place in Bucharest and will consist of many joint activities and events.